Made a quick run into CVS today and they had a few end caps full of Green Tag Clearance....lots of misc. items (make-up, lotions, paper plates,plastic cups, nail polish, summer items, etc.) . They also had several stacks of CVS Brand Ultra Thin diapers for just $2.25 a pack!!! I have never personally ever used Ultra Thins by CVS...but for $2.25 a pack...I am sure they are fine even just for the daytime!! At my local CVS they only had size 1, 2, and 3. So unfortunately, I could not buy any for Little Miss!! Darn!! So if you are heading out to do a little CVS-ing in the next few days...make sure to check for Clearance!! A little over a week ago I had a nice brunch for my Mom's Birthday along with several family members. I was looking for a new recipe with fruit in it to use as an appetizer....so I did a little online recipe searching. I came across this recipe on All Recipes for Sweet Summer Fruit Bruschetta. It sounded so delicious....I just had to give it a try!! Since the brunch I have had sereral phone calls from family members requesting I email them the recipe. It was very easy to make...and from the feedback from my family, hubby and I were not the only ones to fall in love with the recipe!! So in case you too are looking for a great addition to your summer brunch, or even an afternoon snack for the family....give it a try!! Trust me you will be asked for this recipe again and again!! Lay the baguette slices in a single layer on a large baking sheet. Stir together the butter, 4 tablespoons brown sugar and cinnamon and spread on one side of each baguette slice. Broil for 1 to 2 minutes or until bubbly and bread is lightly browned on the edges. Stir together the remaining brown sugar, fruit and lime juice in a small bowl. Spoon equal amounts over the bread slices and sprinkle with walnuts. *I added a bit more fruit to my recipe....I used 1 cup of each fruit!! When It Works Out In Your Favor!!! I had to make a quick run yesterday to Home Depot, as one of our bushes died in our yard. We had just purchased 3 of the exact same bushes for one of our flower beds back in April of this year........and one just did not survive?? And....yes I did water it regularly! Not to worry, Home Depot along with Lowe's offers a 1 year stay alive Guarantee!! You must save your receipt though!!! So I went back today and returned the poor dead bush and got back the $14.97 on a gift card for the original purchase price I paid. I headed out to the Garden Department in hopes that I would find the same Arborvitae that I had returned...but no such luck!! If you are in need of some bushes for your yard...you may want to check out your local Home Depot....or even maybe Lowe's for Clearance as the planting season will be over before you know it!! You Must Be On Your Toes!!! Well I headed to ShopRite today for our weekly trip....and as always I had a ton of coupons I had handed to the cashier prior to ringing up my order. Most weeks I have well over 10 coupons!! With the 2 kiddies in toe sometimes it is a bit hard to stare at the computer monitor when the cashier is taking off the coupons at the end of the order. And I was so very tired of trying to remember just how many coupons I had to be taken off. So I started writing the number of coupons I am using on the shopping trip on the front of my circular with a circle around it. This way at the end of my receipt I can just count the # of coupons and realize right away if any were not scanned!!! For me this way seems to work!! Today while at ShopRite, I had 15 coupons I was using for this weeks order. I payed, received my receipt, grabbed my bags, and left the checkout station. I pulled over to the side before the exit of the store and counted the # of coupons taken off.....guess what...1 was missed!! And a $2.00 off one at that!!! So I proceeded back to the register to ask the cashier that had rang me up where the $2.00 off coupon was on my receipt?? She handed me the coupon back and said go to customer service for a refund!! She did not even look over the receipt or anything!! It kind of stinks that I have to double check that all my coupons were taken off correctly each and every week. But, unfortunately I must because it happens almost every other week it seems!! Whether it is missed scanned coupons, items of the incorrect size on the end cap with a sale sign for the the smaller sized product, not having items in-stock that are on sale, and making sure they do not bag my dryer sheets with my bakery items...(YUCK!! It has happened many times!!! Nothing worse that a dryer sheet tasting roll!!!!) You must be on your toes and pay attention while at the grocery store...or else you may be paying too much and not even notice!! This past weekend Little Man and I along with his little friend headed to a local farm to spend a few hours picking and playing. We got to pick Corn and Peaches....and let me just tell you they were delicious!! We had never been picking together before and we had a great time!! Here are a few pictures of us at the Farm!! Be sure to check out 5 Minutes For Mom for lots more Wordless Wednesday photos!! *Little Mommy Twin Baby Dolls.....Just $4.37!! (Regularly $17.48) Little Miss will love these under the tree!! *Bucket of Sidewalk Chalk...Just $1.31 (75% Off) !!! My Kiddies love to draw with this stuff outside!! *Hot Wheels Car Shooter....$3.74 (75% Off)...Great to have on hand...as the holidays will be here before you know it!! *Pair of water shoes for Little Miss for an upcoming vacation next week...these were $4.18...only 30% off, but she needed them!! If you have yet to get a chance to run into Target...hurry!!! Hopefully you can still rack up on a few great Clearance deals!!! Already went?? What did you find cheap?? Happy Hunting if you go!! New York & Company has lots of women's summer clothing on sale....as they are starting to bring out the fall fashions now!! Click here to see all the sale items. Sizes and colors are limited...so for best selection shop early!! To save even more use these great coupon codes at checkout!! This week's Tipster Tuesday over at BeCentsAble is all about Recycling and Re-purposing items. As I have posted many times in the past...I am a huge fan of both of these things!! Why throw out something that is perfectly usable?? In some instances if the item is not usable to you...trust me there is someone out there who may have just the perfect idea on what to use it for!! Recycling: Is a big must in our family!! We are big recyclers of our plastic, paper and glass weekly as part of our town-wide Recycle Bank program. We earn points for the amount of products we toss in our large wheeled recycle bucket. We can then cash those points in toward coupons and gift card for local and chain business in our area. We have been participating in the Recycle Bank program for about 6 weeks now...and with the incentive to earn coupons and gift cards I have noticed....we are recycling way more!! Weekly we only have one trash can of trash....as apposed to the 2 to 3 cans we used to place at the curb each week!! We love the new program....not only are we helping the environment...but we are also earning money back too!! Re-purposing/Reusing: In our house we try to use things for as long as we can...or until they break or wear out. Sometimes though we have an item that is still in perfect condition...but we just no longer have a use for. This happens alot with kiddie items, clothes and toys...as the kiddies grow...there are alot of things they no longer use or need. So in this case, I am a huge fan of Freecycle for passing things on to others we no longer have a use for. Freecycle is a great way to de-clutter our home and give people things they they can use in the process! I have given away many, many items on Freecycle over the years I have been a member...but there is one item that I gave away that I will never forget the recipients appreciation for! A member posted a wanted notice for a winter jacket for her little boy....as he had ripped his while playing outdoors and tore a hole in it and the stuffing was hanging out. One of my close friends had given me her sons winter coat for my Little Man, it was in great condition, it was just to small for her son...but my Little Man already had 2 coats in that exact size. So I offered it to her and she was so happy and appreciative for it!! It made by day I could find it a new home and that it was being used to keep someone warm!! We also have bought plenty of used items over the years as well!! Browsing yard sales, searching Craigslist, and looking on Ebay are all common places you would find us browsing! There are many items we have seen and even purchased that were gently-used that look brand new. I have even purchased brand new items at yard sales, on ebay and even Craigslist for just a fraction of the regular price!! This is a great way to buy baby clothing...as most times people receive gifts for their baby and never even get a chance to wear an outfit or two...or only get to wear it once!! Toys are another great yard sale find...my Little Man loves shopping yard sales....to him it is like a treasure hunt....trying to find the perfect toy he would like to purchase with the few dollars he has saved up!! He has gotten lots of cool new toys-to-him for next to nothing! Both Recycling and Re-purposing work great for us in so many ways! Now in our home we are so used to it....it has become a way of life!! If any of you have Thomas & Friends fans in your house...you know just what kind of project it is to set up a new branch line....getting all the brides, tunnels, buildings, etc. to fit just perfectly where Little man would like to see them placed. My Little Man still enjoys playing with his Thomas trains and tracks...but if there is only a wrecked Branch Line....(Thanks to Little Miss) What fun is it to play with? On occasion Little Man will ask me or Daddy to help to build him a new branch line....let me just say it is a rather tricky task!! You have to clear the table...which Little Man and Little Miss usually do together. Then you have to get Little Miss engaged in a toy and to find somewhere else to play...or she plays train table wrecking ball...LOL LOL Next you have to try to set up a branch line making sure the tracks stay within the perimeter of the table and all connect so the trains can drive all about the tracks!! Hubby and I have had years of practice....but still each and every time it is a tricky, yet fun experience!! Little Man is also a big help in the process too. He can sometimes find just the right piece to make the loop complete!! Plus...he is ever so excited to play with the finished Branch Line!!! So this weeks Tackle is building a new branch line for Little Man!! He has been asking for a few days now....we have just been a bit busy to seem to get to it. But no more....to the train table we head!!! Isn't it pretty!!! I am proud of it....as is Little Man!!! Be sure to visit 5 Minutes For Mom for lots more Tackles getting done today!!! Well summer is in full swing now....and unfortunately the bugs are hip to us being outdoors a lot more! Just the other night, we were all outside at a friends house and the bugs seemed to be attacking our legs non-stop!! Of course the week before while at another picnic, our Skin-So-Soft seemed to of fallen out of our pool bag so that is the reason for our most recent bug bites!! Ouch!! Not to worry though....if you have little ones and need to keep them bug free (and yourself too! )....Avon has all their Skin-So-Soft marked down to 50% off!! I just ordered a replacement today for the missing Skin- So-Soft Bug Guard Plus we lost for just $5.99! And the best thing is that is is totally safe for the kiddies to use as well....it contains NO Deet! Plus it is also a sunscreen of 30SPF so perfect for those beach days! To save on shipping...find an Avon Representative near you here. It will then give you the option of a local representative delivering it to your home personally to save on shipping costs. Or if you spend $20 or more use code AVN20FS at checkout for Free Shipping!! Wishing you a bug-free rest of the summer!! A few random deals I came across for this week.....all kiddie/baby related. Need Apple Juice this week for the kiddies?? Hopefully you have an Acme around your way.....if so you are in luck!! This week through Thursday July 31st. Acme has Store Brand Apple Juice just 5 for $5 (64 oz. bottle)!! Must use the Super coupon on the front page of the store circular for this deal!! Also included in this deal is Acme Cranberry Juice Cocktail as well. Doing the Johnson & Johnson Deal at CVS this week?? Be sure to check the USA Weekend Magazine that comes in your local Sunday newspaper (if it is included in your Sunday Paper).....in ours there was a $1.00 off any J&J Baby lotion coupon that expires in 10-08. Most weeks..I never even open up this magazine!!! That has changed from this week forward!!! LOL LOL Remember this weeks J&J deal at CVS is if you spend $20 on participating J&J baby products you get $10 back in ExtraBucks!!! Still have your Luvs $5 coupon to use? This week ShopRite has Luvs diapers on sale for $7.00 a pack...a savings of $1.50! Use the $5.00 off coupon and you pay just $2.00 for a pack of diapers!!! Yeah...great deal!! Plus...that helps you earn towards your ShopRite Baby Bucks...spend $75 in baby-related products and get a certificate for $10 off your next shopping order of $50 or more!! A great Perk of ShopRite!! No ShopRite near you...No Problem!! At my local Walmart, they have Luvs for $6.99 a pack regular priced!! Come across any other great kiddies realted deals for this week?? Feel free to leave a comment!! What better way to start off the week than with Freebies?? So here you are...Happy Monday to you!! StayFree-Ultra Thin with wings Free Sample. Ultra Downy Total Care Fabric Softener- Click on the Orange Special Savings button on the left side. Meow Mix - Wholesome Goodness Dry Cat Food Sample from Walmart. Eucerin- Enjoy a free sample of Eucerin Redness Relief. Geo Trax DVD- Free sample DVD disc of Geo Trax...features 3 mini episodes!! Start by clicking the US from the drop-down menu bar on the top right side of the page! These weekly back 2 School Deals start today and run through Saturday August 2nd. But if you see something you like I would head to get it ASAP...as these deals are while supplies last!! *Office Depot Washable School Glue......Just 1 Cent Each, Limit 5 per customer!! *Office Depot Marble Composition Books, College or Wide Ruled....Just 30 Cents Each!!! Limit 5 per customer. *Crayola Colored Pencils, 12-pack, Only 50 Cents a Pack!!! *Office Depot Faux Wood 12" Ruler...Just 5 Cents Each. Limit 5 per customer. *Wilson Jones 1" Assorted Poly Binders......Just 50 Cents Each!! Limit 5 per customer. **Free After rebate Item of the Week** is Ticonderoga Dry Erase Markers, 4 Pack....Limit 1 per customer!!! *Pentel gel pens, 4 pack.....Free after rebate!! *Electric pencil sharpener.......Free after rebate!! Mmm....Tastes Just like it Should!! A few weeks ago in the 6-08 Sunday paper there was a $1.00 off coupon for New Jell-O Singles. We are a pudding loving family....so when I found them at Target I just had to give them a try!! They were $1.79 for 6 packets...minus the $1.00 off coupon..so just .89 for 6 single-serve homemade (well sort-of) puddings!! What are Jell-O Singles, you ask?? The box states that they are ready in minutes, after adding just milk to the pudding packet and stirring!! They are also sugar free and only 80 calories per serving. I figured it would be neat for Little Man to make the pudding he would like to eat...as he is really getting BIG into cooking/preparing food these days!! So...after about a month buried in the snack cabinet...they re-appeared yesterday, and we decide to give them a whirl. If you have a little cooking helper in your house...Jell-O Singles are an easy yummy kid friendly treat to make!! I had received the Summer edition of the Kraft Food & Family Magazine a while back....and I took a look through it and off to the cabinet it has been sitting. So yesterday, while cleaning out the kitchen cabinet I came across it again. I was flipping through and decided to give the Santa Fe Chicken Salad Wraps a try for dinner. They are amazingly easy to make and the are just as delicious to the taste!! We loved them!! And the ingredients you need to prepare them you probably already have on hand. Next time you are in a bind on what to make for a quick, easy meal...give them a try!! Toss in a large bowl....Romaine, Chicken,tomatoes, and corn. Then add cheese. Next in separate bowl combine dressing and salsa. Pour over Romaine mixture and toss to coat. Spoon evenly onto tortillas. Roll-Up and Enjoy!!! So I paid just $12.52....Plus I earned $5 in ExtraBucks for the CVS Deal!!! Not bad for 3 packs of diapers and cotton swabs!!! See more CVS Superstars at The Centsible Sawyer! 1. I have to have ketchup on a Soft Pretzel...it's delicious...I've been doing this since I was a kid. 2. My first job was working at a farm stand on the side of the road...Man they were some HOT summers!!! 3. I cannot sleep with socks on in the summer...it's just too hot for socks!!! 4. I do not wear shoes in my house...I just cannot bring myself to do it....LOL LOL It's my Mom's fault I guess it was a rule when we were growing up. 5. My fingernails are never painted...but my toes, Always. 6. Do not bother me on Monday nights at 10pm...."The Hills" is on....I cannot wait for the new season to start!! Look At All the Trucks!!! My Little Man is in truck heave since last night!! A nice lady on Freecycle offered a BIG box full of Rescue Vehicles and Accessories that her son had outgrown. So yesterday hubby ran over during his lunch break to pick them up....He brought them home after work, I wiped them all down and sanitized them....and Little Man and Little Miss are having so much fun playing with them!! Most even came with working batteries and make all sorts of siren noises!!! Made a Target Run yesterday.....and the Target I went to was plum full with loads of Clearance!!! In almost every department too...especially the baby section!! If you or someone you know is expecting...head to Target for some great deals!!! They had lots of clothing, bedding, bath toys, onesies, layette, bibs, almost every car seat/infant carriers was marked down between 15 (most) -30%, and lots of misc. baby related items as well!! The new carseats are about to come out soon, I suppose?? *Picked up 3 pairs of sandals for next summer for Little Miss....all were 75% off....paid just $1.74, $3.24, and $2.98 for each of them!! *Got Little Man 2 pairs of shorts for next summer...75% off...just $3.74 and $4.24 a pair!! They are Mossimo brand too!! *Picked up an Oshkosh cute little shirt for Little Miss for just $2.24...75% off, for next summer!! *Also picked up a few baby items as well...all 75% off...as my friend is due with a baby boy in October. Sorry cannot get into it more...as I want it to be a surprise for her!! I hope to hit another Target over the weekend...as maybe I can find more deals like these!!! Let me know what you find go if you go!!! Late last week I made a quick run into Acme to pick up my sweeper cloths, and since I was there I picked up a 1/2 gallon of milk that I had a coupon for to hold us over till our ShopRite trip. We were in and out in a matter of minutes...I had promised the kiddies a trip to the park...so they were ready to go have some fun!!! I stop off at home to drop off the milk and off to the park we go!! The next morning....I open up the fridge to get the 1/2 gallon of milk out...and guess what it is expired!! It stinks!! Man.....so much for holding off on our ShopRite trip for another day!!! * A Powerade 32 oz. for $1.00 (Used one of the $1.00/1 Powerade coupon from last Sunday's insert's) So this was FREE!!! *2 rolls of Viva Paper Towels for $1.89 each. I had (2) .75 off coupons from the 7-13 SmartSource insert. Acme doubles coupons up to .99...so they doubled these to $1.50 off each. I paid just .39 for each 112 sheet roll!!!! Plus, they are Choose-A-Size rolls too...great for all kids of spills!!! Be sure to check out more Wordless Wednesdays at 5 Minutes for Mom! I am a huge Swifter fan....in fact I am not sure what I would do without my Swifter Sweeper!! I also love the Swifter dusters.....they only problem is I find that the price of the refills for the dusters is absolutely outrageous!!!! At our local Dollar General they used to have a knock-off brand...5 refills plus one handle in a pack for $2.00. A little steep.....but the quality was good and they made cleaning a bit easier...so $2 was a small price to pay!!! Then one day I ran into Dollar General to pick up a box...and guess what...the had none!!! And the spot they were usually kept in now had a new product and label in it's spot. They now had a new knock-off brand...5 dusters for $1.75. Okay....I thought I'll give these a try...so I picked up a box and was on my way. I get home take a duster and refill pad out of the box and get started cleaning....well attempt to, anyway!! I quickly discovered this new knock-off brands stink!!! They hold no dust.,..just move it around into the air...and the handle is the flimsiest thing I have ever seen!! Every time you go to dust the handle collapses!! I spent more time trying to keep the handle in place than dusting!!! So back to Dollar General I went a few days later. I had noticed when I had went a few days earlier that they had Mr. Clean Microfiber Mitts. It was just $1.75 and it was machine washable!!! Perhaps this would work for me. Plus...there would be no more refills to buy...ever!! I took home my little mitt....and got started cleaning the blinds. It is amazing!! Collects the dust very well...and fits on your hand just like a mitten does..never moves, falls off, shifts,...just fits perfect!! It is great for dusting mini blinds, baseboard, the tops of pictures hung on the wall, wall shelves, ceiling fans...and much, much more!!! And the best part is that it reusable......I just toss it in the washer...it comes out like new!! I have had my little dusting mate for about 6 months now and it really makes dusting a little less of such a terrible task. So Thank You Dollar General for discontinuing the old knock-off dusters...or I never would of discovered my mitten!! 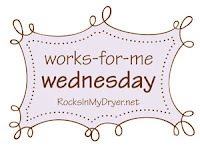 Be sure to head on over to Rocks In My Dryer for more Works For Me Wednesday Tips!! So you grab a baking pan, place a piece of leftover pizza on it and stick it in the oven say on 350 degrees for 12 minutes. The timer beeps, you open the oven door...and lo and behold....most of the cheese from the pizza slice is all over the baking pan!!! Man...what a mess to clean up!!! If this sounds like a true story...it is, really!! Has happened to me many times!! In the mood for more tips?? Be sure to check out more Tipster Tuesday at BeCentsAble!! Freebie For All the Little Guys!!! Wondering What His Name Is?? Heading to Toys R Us??? All for just 9 Cents!!! Mmmm...A Great Way 2 Cool Off!!! Do You Have a Kitchen Helper?? Hanger Strings....Love Them OR Hate Them??? Look Out....I'm Onto The Garage!!! A Must Read: Parenting, Inc. Hot??? How About a Slurpee??? Time to Print Your Prints!!! Back to School Sales Already??? Yummy!! And Only 5 Ingredients!! !